Where is the escalator emergency stop switch (key switch box) installed? What risk factors of injury when escalators are running normally? The gap between escalator steps and apron boards, although it is very small, but it’s certainly the most dangerous place for escalators to hurt people. In particular, some children like to put their feet on the apron board when taking escalators. If the toe of shoes, shoelaces or pants edge is involved in the gap carelessly, they will bring their feet in. The end of handrail is easy to hurt hands. The escalator gap between the handrail and the wall in some shopping mall is very small. If you take the escalator and forget to let go or let go too slowly, your hand will be caught along the escalator handrail. The comb teeth at the entrance and exit. 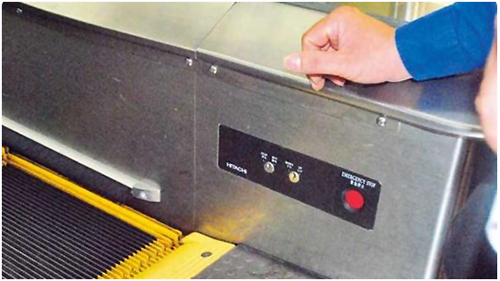 Normally, the carding part of an escalator will have a curve, so that the foot or clothing will not be involved in the operation of the escalator. However, some unqualified equipment, comb teeth will appear defect, gap will have some deviation. Where the ascending escalator intersects with the top, it will be damaged upon contact. If you lean over while taking the escalator, you can easily get stuck in the intersection of the escalator and the top and get hurt. Some hard signs can be used to help the escalator bite people. At the Angle between escalator pedal and handrail, it is easy to hurt feet. To be safe, remember to stay within the yellow line. Automatic abnormal stop –Safety device sensing. For example, clothes are pulled into the escalator or shoes are clamped into the edge of the escalator and so on. When confirming that someone is involved in the escalator, the people around you should quickly find the button and press it decisively. In non-emergency situations, do not press the button by mistake, or if you think it is fun to press it, otherwise sudden stop may cause passengers to fall, fall or step on. However, you should only press the button decisively if you are sure someone is involved. Since it is not uncommon for escalators to roll up people, once it happens, the loss will be very large. Therefore, public places installing escalators should also provide emergency training for service personnel In non-emergency situations, do not press the button by mistake, or if you think it is fun to press it, otherwise sudden stop may cause passengers to fall, fall or step on Therefore, public places installing escalators should also provide emergency training for service personnel. Where is the escalator emergency brake switch (key switch box) installed? The position of the escalator emergency stop button is slightly the same, usually in a prominent position on the top of the escalator. And they’re all red. At the top and bottom of the armrest, both on the edge – red button, press to make an emergency stop. Posted in Technology and tagged cheap escalator emergency stop switch for sale, escalator artificial abnormal stop, escalator automatic abnormal stop, escalator emergency brake button, escalator emergency stop switch, escalator emergency stop switch factory, escalator emergency stop switch manufacturer, escalator emergency stop switch online, escalator emergency stop switch supplier, escalator key switch box, how to stop the escalator when it runs in an emergency situation, where is the emergency stop switch of escalator, where is the red button of escalator.